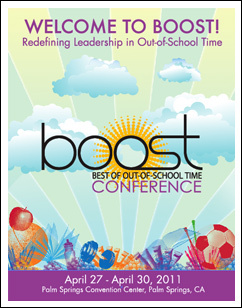 Please click on the 2011 Conference Brochure and download it to see what was offered at the 2011 BOOST Conference in Palm Springs, CA! 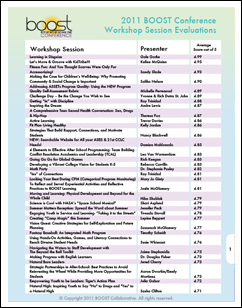 Please click on the 2011 Conference Workshop Evaluation image and download it to see what people said about the workshop sessions! Rivka Burstein-Stern, Field Outreach Coordinator; Chris D’Agostino, Research Associate, Afterschool Alliance, Washington, D.C.
After School University: Youth Development Begins with YOU! Bully, Bullied, or Bystander: Which One is your Student? Fitness Fun: And You Thought Scarves Were Only For Accessorizing! Let’s Move & Groove with KidTribe!!! NEW: Searchable Website for All your ASES & 21st CCLC Needs!